Dior Homme and Sennheiser have announced the latest fusion of fashion and technology in a partnership being called Dior Homme x Sennheiser. The fusion of Dior Homme’s serious styling for men and Sennheiser’s serious audio skills see some of Sennheiser’s best products given a luscious black and anthracite design with fine red highlights. 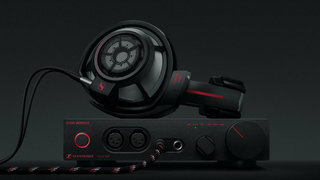 The special editions cover the Sennheiser HD 800 S headphones, the HDVD 800 headphone amp, PXC 550 wireless headphones and the IE 800 in-ear headphones. However, the partnership has resulted in more than just the audio products alone, as Dior Homme x Sennheiser offers collections with custom accessories. The home solution gives you all the headphones and the headphone amp, but you also get matching storage furniture comprising to units with drawers lined with calfskin leather, so you can store your HD 800 S in style. There are also leather pouches for the smaller headphones, so everything is perfectly protected. The home solution, wait for it, will cost you £7600. For those on the go, the travel solution is suggested. This pairs the PXC 550 wireless and noise-cancelling headphones with a mini leather backpack to take on your travels and be a home to your headphones when they are not on your head, as well as giving you the space to carry your other essentials. The travel solution is £1750. Or there’s a daily solution, with a Dior Homme leather clutch to house your PXC 550 headphones, which is a little cheaper at £880, or the in-ear pocket solution which is also £880.